In a fun interview early this year, Kyle MacLachlan visited the Late Show where host Stephen Colbert reveals that as a young man he desperately wanted the role of Paul Atreides in David Lynch's adaptation of DUNE (1984), which ultimately went to Kyle MacLachlan in his first film role. The two have a fun time reminiscing about some of Kyle's other David Lynch roles, particularly in Blue Velvet (1986). 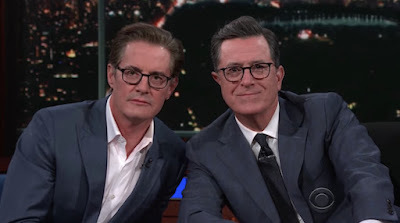 Colbert reveals that many of his friends gave him a hard time for looking so much like Kyle when that film was originally released. The two relax and drink some of Kyle MacLachlan's own label of red wine, "Pursued by Bear." They talk about their careers, similar looks, and discuss some of Kyle's more recent roles. From the Mayor of Portland in Portlandia (2011-18) to his return to his most famous TV role as Agent Cooper from David Lynch and Mark Frost's Twin Peaks (1990-91) and its newly revived form: Twin Peaks: The Return (2017).